A new flying record has been taken by the super lovely low-cost airline Norwegian, they've set a new record time for the fastest ever transatlantic flight by a subsonic passenger aircraft this week using one of their state of the art Boeing 787-9 Dreamliner aircraft. 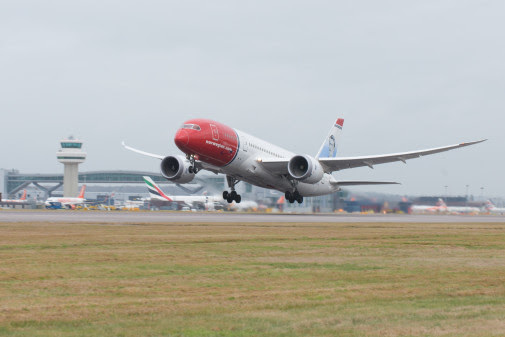 The Norwegian flight, DY7014 departed from New York's JFK airport on 15th January and landed as London's Gatwick airport just 5 hours and 13 minutes later – it is the fastest transatlantic flight recorded on a subsonic commercial aircraft. When we first saw that record, we thought perhaps it had been a special flight with very few passengers onboard, but that proved not to be the case. Flight DY7014 was a normal flight carrying 284 passengers and took-off JFK at 11:44am and arrived at LGW at 9:57pm – a super 53 minutes early. The day before the record-breaking flight, London Gatwick-based Captain Pascal Niewold recorded his fastest ever transatlantic flight of 5 hours and 20 minutes while flying the Boeing 787 Dreamliner from New York to London on Sunday 14 January. The flight had a maximum tailwind of 195 knots (224mph) and reached a top speed of 779mph. In a rather fitting coincidence, the tail fin hero pictured on the 787-9 registered G-CKHL that operated the record-breaking transatlantic flight, is Amy Johnson, the pioneering pilot who was the first female to fly solo from England to Australia in 1930. 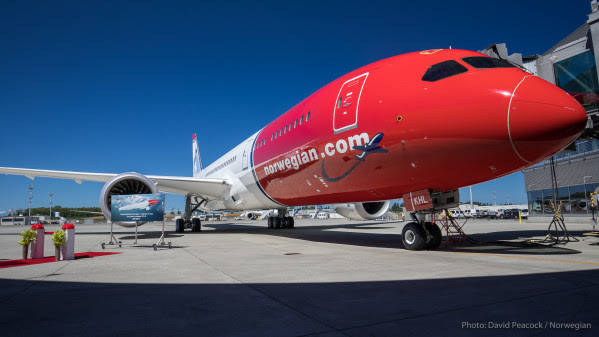 Norwegian has an impressive growth record and is now Europe’s third largest low-cost airline, they operate double daily flights between London and New York using the 787's and during 2018 the carrier will take another 11 of the dreamliners. The configuration deployed on most of Norwegian's new 787's will include an additional 21 seats in their Premium cabin to make a total of 56! Norwegian carries 5.8 million UK passengers each year from London Gatwick, Edinburgh and Manchester Airports to 50 destinations worldwide. Norwegian is the third largest airline at London Gatwick, with 4.6 million yearly passengers, and with more than 1,000 UK-based pilots and cabin crew. In 2014, Norwegian introduced the UK’s first low-cost, long-haul flights to the U.S. - the airline now flies to 11 U.S destinations, Buenos Aires and Singapore. In 2017, Norwegian also launched affordable transatlantic flights from Edinburgh, Belfast, Dublin, Cork and Shannon to the US East Coast, using the brand new Boeing 737 MAX aircraft. Norwegian is the only airline to offer free in-flight WiFi on UK flights to more than 30 European destinations. The airline has one of the youngest aircraft fleets in the world with an average age of 3.6 years, including next-generation Boeing 787 Dreamliners, Boeing 737 MAX and Boeing 737-800s. Indeed, Norwegian has been voted ‘Europe’s best low-cost carrier’ by passengers for five consecutive years at SkyTrax World Airline Awards from 2013-2017, along with being awarded the ‘World's best low-cost long-haul airline’ in 2015, 2016 and 2017. Oh and whilst this is a rather glowing article about Norweigan, it is just an honest reflection on an airline that realises that its passengers are actually people and not just a walking cargo! 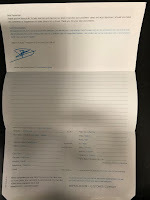 Just so we're clear, we've taken no payment or inducement of any kind from Norweigan or anyone else for that matter, to write these words!